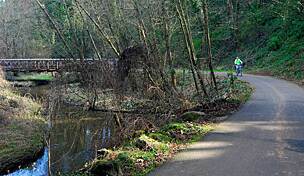 Located only 26 miles west of Portland, the Banks-Vernonia State Trail is a 21-mile paved route that is surrounded by splendid forests, crosses over 12 bridges and trestles, passes alongside crystal clear streams, and travels through a state park. The route offers visitors the opportunity to experience a slice of the region’s history as it follows the corridor once traveled by the Spokane, Portland, and Seattle Railway. 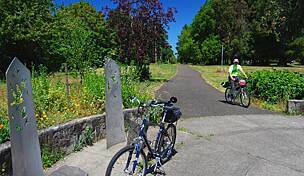 Bike from Vernonia to Banks and along the way see relics from the railroad’s heyday, stop to stretch your legs on a hiking trail at Stub Stewart State Park, and immerse yourself in the majestic woods that surround the trail for virtually the entire route. The timber industry once dominated this northwest region of Oregon. The route the Banks- Vernon Trail (BVT) follows dates back to the 1920s when the rail line was used to haul logs, lumber, freight, and passengers from Vernonia to Portland. 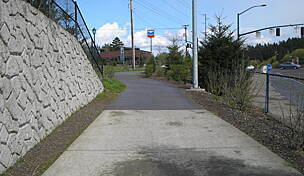 The line was abandoned in 1973, purchased by the state in 1974, and became Oregon’s first linear rail-trail in 1991 (it was completed in 2010). Today’s trail users will find a well-maintained route with picnic tables, benches, and portable restrooms and water fountains at several of the trailheads. 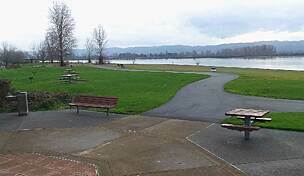 While there are no trailside adjacent businesses along the way, there are restaurants and shops in both Banks and in Vernonia to either grab a picnic lunch or to dine onsite. The BVT is a popular local trail and on weekends you should expect to see crowds, especially close to trailheads. The route does include some steep sections, and switchbacks, which can be slippery in wet weather. Just outside of Vernonia, stay at the Coastal Mountain Sport Haus. Designated as an official Bike & Environmentally Friendly Inn by Travel Oregon, the inn is a popular spot for folks biking from Portland to the coast and for BVT riders. Owners Glen and Sandy have created a rural retreat inspired by accommodations they enjoy on their own cycling trips to Italy. The inn was designed by the innkeepers and built by local craftsman to reflect the spirit of the Northwest, and each of the four large guest rooms has stunning forest and meadow views. From the porch, spot deer, elk, coyote, and maybe even a bobcat. A gourmet breakfast and dinner is included and guests can also take advantage of a complimentary yoga session, as well as enjoying amenities such as the custom soaking pool. The owners encourage guests to experience this slice of Oregon as a car-free destination and offer a 5% discount for those who arrive by bicycle. If you are arriving from the Portland or the airport, it is possible to take a series of buses and trains to reach downtown Vernonia. Note however, that bus service does not operate every day. Click here to find an online planning tool that will help you navigate to and from Vernonia using public transportation. 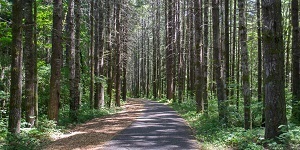 If you need to rent a bike, drive to the Banks trailhead about 32 miles away, where Banks Bicycles is located. This shop offers hybrid and tandem bike rentals, as well as having a full service department. Banks Bicycles is open seven days a week, although they do close early on heavy rain days on Sundays and Mondays. The shop offers a ‘rescue service’from several points along the BVT, should that be necessary. Note that if you are renting a bicycle and starting the trail here, you will be following the proposed itinerary in reverse. This direction is actually slightly easier as the steeper incline will be in the first three-fourths of the ride rather than on the back-end. Our itinerary travels from Vernonia-Banks, rather than the other way around, given the location of our lodging. To reach the Banks trailhead, follow OR-47 S. In Banks, take a left on NW Banks Road, and an immediate left on to NW Sellers Road. You will find the parking lot and trailhead on your left, and located just slightly further along Sellers Road, find the bike shop. 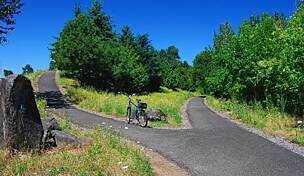 After enjoying a delicious gourmet breakfast at the Inn, drive or bike 10 miles to reach the Vernonia trailhead of the BVT. Follow OR-47 S to town. In Vernonia, OR-47 becomes Nehalem Highway. Turn left off of Nehalem to Adams Avenue and follow this down to Anderson Park. Park here and find the trailhead across the parking lot. Before setting out from Vernonia, if cold drinks or snacks are needed stop in to Sentry Market, a locally owned grocery store located about two blocks from Anderson Park on Jefferson Street. 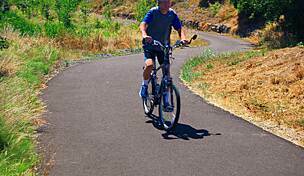 Leaving from Vernonia, you will be biking up a gentle incline for several miles before reaching a steeper section near L.L. ‘Stub’Stewart State Park. Spread across 1,800 acres of rolling hills, forest glades, crystal streams, wildflower meadows, and featuring more than 25 miles of trails, this state park offers beautiful views of the Coastal Range. Take a quick diversion to visit the Discovery Depot in the welcome center to learn more about the flora and fauna in the area, spend a little time exploring some of the trails either on foot or by bike (you will need a mountain bike), or enjoy a game of disc golf on the 18-hole course that winds its way through trees. Back on the trail, farther along at the Buxton trailhead, enjoy spectacular views as you cross over the Buxton trestle, a 700-foot long, 80-foot high structure. Here you will also find a portable restroom, if needed. 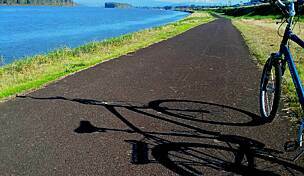 Enjoy the descent in to Banks as you bike through pastoral farmland. Be careful not to get going too fast. This section of the trail can be crowded, and as you will have noticed, a horseback riding trail runs adjacent to much of the BVT. Be cautious when passing horses to avoid spooking the animals. In Banks, stop for lunch at the Banks Trail Cafe. Located close to the trail, take a right on NW Banks Road and an immediate left on OR-47 S/Main Street and look for the cafe on your right a few businesses along the route. This small cafe serves breakfast and lunch and offers a variety of sandwich options such as turkey-cranberry, classic club, barbecue beef, as well as paninis, soups, and salads. The cafe is open Mon.-Sat. If you just want to grab some fresh fruit, a cold drink, or a snack, head farther down Main Street to Jim’s Thriftway, a locally owned grocery store. This is also the perfect place to pick up fixings for a picnic lunch, which you can stop to enjoy at one of the trailside tables on the return trip. 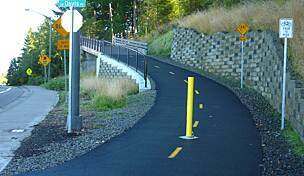 While the first section of the route towards Vernonia will include some uphill riding, enjoy the descent in to the town at the end. As you will have noticed on the way out, there are some bumpy sections to the trail in this area, so be cautious on the downhill. Set amidst one of the most important timber producing areas of the state, not surprisingly, the town of Vernonia has its roots in the timber industry. Today, this small town has a fun vibe that makes it a popular destination for cyclists and other outdoor enthusiasts. Upon your return, if you are still in need of lunch or want to grab a drink, stop by the Blue House Cafe for a gyro platter at this Mediterranean restaurant located in the heart of the town. They offer an extensive menu featuring numerous Mediterranean dishes, as well as coffee drinks and a selection of homebrewed beers. Also in town, visit the Black Iron Grill. This casual restaurant serves breakfast, lunch, and dinner, and has a whimsical decor that reflects the town’s logging past. In addition to comfort foods, it has a full service bar. In town, visit the Vernonia Pioneer Museum. Located in the former Oregon-American Lumber Company Mill Office, this historical building is listed on the National Register of Historic Places. Visitors will get a glimpse back in to life during pioneer times and learn about the town’s heyday as an important mill town. Vernonia was considered a ‘company town,’ as the lumber company employed nearly 2,000 workers during its peak in the early 1920s.The museum includes artifacts from local Native American tribes, photos from the logging days, information about logging, and other interesting details about Vernonia and the surrounding area. Head back to the Coastal Mountain Sport Haus and enjoy a nice long soak in the pool or a nap on the porch. Tonight, relax with a glass of wine as your linger over a homemade dinner and absorb the ambiance of this rural hamlet. Be sure to take advantage of your hosts’ knowledge of bicycle routes in the area for recommendations on other on and off road trails that may be of interest. 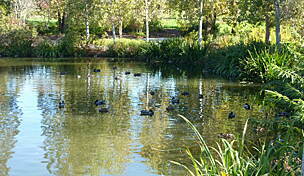 While in the area, explore some of the nearby attractions. Located about an hour away on the coast is stunning Cannon Beach. The Oregon coastline is well known for its dramatic landscape of boulder-filled beaches, towering cliffs, and endless vistas. Cannon Beach, with its iconic Haystack Rock, is considered to be one of the most beautiful of them all. Stroll the beach, wander through the numerous shops in the downtown area, take a horseback riding adventure, hike, surf, and spot coastal wildlife. There are countless activities that will immerse you in the stunning natural beauty of the area. In the opposite direction, located about one hour to the southeast, explore Sauvie Island. Situated on 24,000 acres at the confluence of the Willamette and Columbia Rivers, and just 10 miles northwest of Portland, this small island offers spectacular scenery and an abundance of wildlife. Hike along trails that take you amidst mammoth big leaf maples and Douglas firs and look for bald eagles and numerous other bird species. Hike the Warrior Rock Lighthouse Trail to view Oregon’s smallest lighthouse. Visit Kruger’s Farm to pick your own berries; enjoy an outdoor concert during the summer; or if you are there on a Friday or Saturday night, take advantage of their farm-to-table dinners served al fresco. While Vernonia is not located in one of Oregon’s wine growing regions, it is close enough for a day trip to some of the vineyards in the northern Willamette Valley. 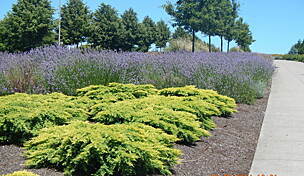 Use this website from the Northern Willamette Vintners to help plan an excursion to this magnificent area. Be sure to include a visit to David Hill Vineyard & Winery on your agenda. Located in Forest Grove, not far from Banks, this stunning property includes sweeping views of the coastal range, and offers tastings, tours, as well as hosting a number of special events.